Today I want to focus on what I think is one of the best features in Canvas: there are two different "deadlines" for any assignment, not just one. Generically, these are usually referred to as "soft deadline" and "hard deadline," although I like to call it a "grace period" when explaining the system to my students. D2L did not have a two-deadline option — not for quizzes anyway, although for reasons unfathomable to mere mortals, they did offer it in the Dropbox (which I never used). In Canvas, it's consistent across the system: if you have a due date, you can choose a soft deadline and a hard deadline, and I would urge everyone to consider taking advantage of this system. I cannot imagine teaching without it! In my classes, I use the "grace period" as an automatic emergency extension, no questions asked, so that if students are a little bit late with an assignment, they can still turn it in, no problem, no penalty. Specifically, I have assignments that are due by midnight on such-and-such a day, but there is a grace period until noon the next day, and I offer that "grace period" for every assignment in my class. Advantages. There are several advantages to this approach. Just practically speaking, it means that midnight does not become some kind of fetish. Sure, if I say something is due on Tuesday, I'd like for them to finish the assignment on Tuesday, but it honestly doesn't make any difference if students turn something in at 2AM as opposed to midnight. I'm not awake at 2AM, but I know that many of my students are. This approach also respects the fact that there are all kinds of emergencies that come up in people's lives; that's only natural. Students shouldn't have to share those details of their private lives with me, and they shouldn't need me to pronounce on what is a "legitimate" emergency or not. If they consider something an emergency so that they are not able to finish an assignment on time, that's totally their decision, and they can finish up the assignment the next morning. I also offer extra credit options to make up for assignments they miss if the grace period is not enough; I'll write about that in a separate post. Grace period in D2L: so clunky! When I used this system in D2L — and I did, for many years — it was really clunky. D2L has only one possible deadline you can set for a quiz (which is how my students "turned in" all their assignments), so I had to make it the noon deadline of the following day. I would title each assignment based on the day it was due — "Wednesday Storytelling" for example — but that assignment would show up as due on Thursday at noon in the calendar. Even with that serious drawback, I did use this system in D2L, and I was really excited when I learned that this is an easy-to-design option in Canvas, something that is officially built in as part of the assignment/calendar system. Due: The due date is what shows up on the calendar. 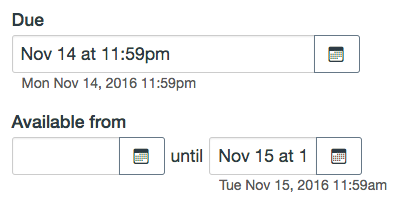 All my assignments are due on a specific day, and I let it default to the Canvas end-of-day time which is 11:59PM. Available from: This is the earliest possible date on which students can complete an assignment. I use this option for only a few assignments. I prefer for students to work ahead whenever possible so, as a general rule, all my assignments are available starting on the first day of class, which means I leave this option blank. Available until: This is when the item actually becomes unavailable to students. So, for this, I set the available until date for every assignment be noon the next day (I use 11:59AM instead of noon to parallel Canvas's default use of 11:59PM for midnight). The grace period is that gap between the "due" date in Canvas and the "available until" date. 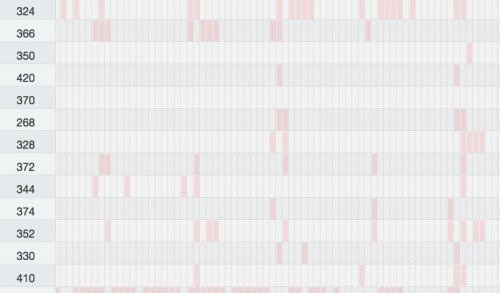 Instead of those splotches of red, I would actually prefer a real report about students who are using the grace period a lot so that I could share that data back with students. Is that possible? I couldn't find anything like that in the Canvas documentation, and given the extremely in-flexible and un-useful Canvas Gradebook, I guess I am not surprised. If I had such a report, I could share that report with students who are struggling with time management so that they would know just how often they are using the grace period. They could then could consider making it a personal goal to use the grace period less often, but Canvas unfortunately doesn't give me any data to use in that way (at least not that I can find out). In terms of my Canvas advice tips, I would rate this one at the very top: it really does help students! So, I would strongly urge faculty to consider using this two-deadline option in Canvas. You couldn't set a grace period with quizzes in D2L, but now with Canvas, you can! 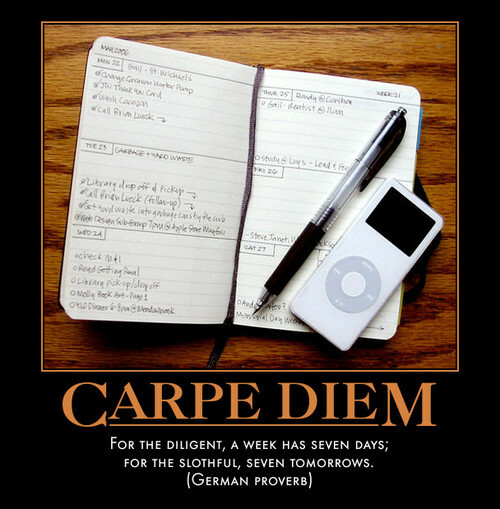 As for procrastination: it's a proverbial problem, something that we are all struggling with: For the diligent, a week has seven days; for the slothful, seven tomorrows. I am grateful for any and every tool I can use that will help my students to manage their time in positive, successful ways. Thanks for this suggestion, Laura. Ours is a Christian liberal arts university, so we encourage faculty teaching online to keep Sundays free of deadlines. Many students do worship and spend time with family on Sundays, but we know that it's a popular homework day as well. Our online syllabus template therefore says the last due date for each week is 11:59 p.m. Saturdays, with no penalty if submitted by 11:59 p.m. Sundays. I'll start suggesting this "grace period" setup. Oh, that's great, Crystal Nielsen ... your students can appreciate the fullest meaning of "grace" of course (I'm originally a Latin-Greek teacher by training, so for me English "grace" is always resonating with gratia and χάρις). Hi Laura Gibbs, have you looked at How do I view Course Analytics? and How do I view analytics for a student in a course? Course Analytics will give you an aggregate of all student on-time, late (grace period), and missing stats. These are helpful tools for not only sharing this data with students, but also enabling you to spot patterns. Hope that helps, great blog post! Thanks Denise Caparula I've seen those screens, and unfortunately they don't help me do what I need to do: the overall aggregate doesn't matter, and the individual student view won't help me unless I can get a sense of pattern in the number of late submissions. Right now it shows the aggregate for the semester, but what I would need would be a total-by-week (my courses are organized into weekly modules). If this were something like a normal spreadsheet, with the number of late items per week, I could quickly write a formula to help me get the pattern I need, but just raw totals for the whole semester does not help. I'm really hoping that the next iteration of the gradebook will allow us to filter the view so we can see selected assignments instead of all-columns-all-the-time. If I get more options for viewing things a week at a time and observing my students' changes from week to week, that will be a big plus. D2L had a lot more flexible viewing options in the Gradebook that way, and I am hoping for more/better viewing options in the next iteration of the Canvas gradebook. In D2L, we could create little fields in the Gradebook on the fly, ad hoc for any purpose, so that worked really well for me to keep a running 3-week window and to communicate with students about that. My feeling about analytics is that one-size-fits-all does not really work, and that we probably each need the freedom to design our own reports. The more analytics becomes like a real spreadsheet that we manipulate for our own purposes, the better. Spreadsheets are powerful! I just wonder why you don't just make the deadline the real deadline. If there's absolutely no difference -- no benefit to getting it in for the "soft" deadline" -- then why not encourage students to get things in early but just have one deadline? The grace period is for emergencies... and there are indeed emergencies in life, plenty of them. I don't want to be getting emails every night at midnight from students who had something happen that day which prevented them, unexpectedly, from getting the assignment done at midnight. That's their business; I don't want to be in the position of adjudicating what is, and is not, a "true" emergency. This way, the students decide, and they have an AUTOMATIC "extension." They don't have to waste their time writing to ask for an extension, and I don't have to waste my time writing back to give that extension to them. Especially if it has to do with their private lives, I really don't even want to know: everybody gets an extension, no questions asked. And since I already gave them an extension, they know not to write and ask me for an extension based on the grace period; they ALREADY got an extension, and so if that was not enough, they can do extra credit to make it up. It's a fantastic system, at least for me; I would never go back to giving out individual extensions one at a time. And by giving universal extensions like this, I earn the students' trust which is good in all kinds of ways. If they had an emergency, that's fine: I don't need them to explain. I trust them to use the extension wisely. Do they have unlimited extensions? Or just one (or two)? If it's limited, this makes total sense for simplifying the process. If unlimited... then how is it different from just having a later deadline? Unlimited, but people who are using it all the time get a friendly email from me offering to help them to rearrange their schedule (my promise to them is that if they give me 6 hours each week, ANY combination of days/times, I will make it work, but it may look a little strange, like the week starts on Thursday and ends on Wednesday, etc.). So... in fact, this is a whole lot more than "managing deadlines." Seems to me this is part of giving students access to the 'hidden curriculum' that doesn't happen so easily in online structures -- the 'managing learning and life' part. Calling it a grace period IMHO is an important language choice -- I bet five bucks that if you called it "no questions asked automatic extension" it wouldn't induce that decrease in extension requests for Taintor Amanda, and the friendly offer to work on the schedules would be less well received. Then it's just a Thing On The Computer, not a human guiding another human down the path of learning. I'm glad I asked Laura Gibbs b/c I'm trying to explore "how can online be more human?" I actually don't even alert students to the existence of the extension/grace period. I'm experimenting this semester with this concept so I can't speak to the "rightness" of my choice, nor will defend it. I did specifically chose not to tell students about it because I hadn't decided on the best language and terms to use, so I settled on not saying anything and just having the quiz not shut down at the midnight deadline. Again, I'm not sure I will do this again BUT as mentioned earlier I don't get the crazy influx of frantic requests the morning after the duedate. I'm imagining the student going to find it and thinking "WOW! I'm in LUCK! It's Still OPEN!!!!" and getting it done thinking they've gotten away with something On the other hand... I feel for the student who perhaps changed travel plans to get things done by "deadline" not knowing there was a grace period... when the student who wasn't so dedicated ... was fine. The single biggest challenge my students have is with time management ... and especially being unskilled about time management, at least when it comes to schoolwork, since they expect the teacher to set the timeline for everything. I am glad that online courses offer so much flexibility, but the students are used to the "everybody does everything at the same time" style of classroom classes (my class is usually their only online class). They find it hard to set their own schedules and stick to them. I also include one of my favorite procrastination cartoons. I have lots of procrastination humor to share because it's something we are all struggling with, of course. And humor helps. I LOVE the grace period idea and started it this semester. I have found a drastic decrease in the extension requests actually down to none for the 70 students I have online this semester. As mentioned in other comments emergencies happen, technology happens as an instructor I don't want to wake up Tuesday morning to requests I have to take to deal with (my due date is Monday at 11:55pm). I took an online course this last year and came face to face with a need to ask for a 1 day extension on a quiz, this experiences made me much more empathetic to "life happening" for my students as well. My 2 cents. I love this idea of a grace period. Although, I'm wondering if this idea could also be useful when having 2 deadlines in discussions. One deadline is for the initial post and the second is for the replies. What are your thoughts on that? Hi Lindsay Gaughan! I don't use the Canvas Discussion Board, so I can't comment on that exactly, but I do have commenting that goes on in my classes (students write blog posts, and then they also comment on each other's blog posts) ... I keep those as two separate assignments, each with their own deadline/grace-period. At least in my classes, there is enough chaos that sometimes students might miss a blog post, but they can still do the commenting assignment. Or, vice versa, they might do the blog post but somehow miss doing the commenting assignment. That's all okay (they can make up missing assignments with extra credit)... but at least for me, it might get confusing not being able to see who did one assignment but not the other. In a Discussion Board assignment, though, that might work differently. I'm not sure really! Boomer Sooner Yeah, unfortunately, with the DB it would have to be one graded assignment because you'd need the post and the replies all in one spot. So yeah, it would work differently but thank you for your insight! Always good to hear what/how others are using features! If you use an ungraded (no submission) assignment for discussion due dates after the initial round of posts, then the ungraded assignments show up on the calendar, the syllabus, and the students' Coming Up list. This last one is especially important; I find that students gravitate to that list to find out what they "have to do." Because calendar events do not appear on the list, ungraded assignments are a better choice for multiple discussion dates, assigned reading, etc. The ungraded assignment does not create extra columns in the grade book either. Stefanie Sanders I had recommended this to my faculty but it seemed as though they were against the idea of just creating a calendar event because they wanted it to all be connected. So if the student clicked on the event they wanted it to take them to the actual discussion post. Correct me if I'm wrong, if they created the calendar event it wouldn't take them to the DB post? Lindsay, it wouldn't be a calendar event, but an ungraded no-submission assignment. Clicking on the link wouldn't take the students directly to the discussion, but it would be a relatively simple matter to incorporate the link to the discussion itself in the instructions for the ungraded assignment (so yes, two clicks). An ungraded assignment has the advantage over a calendar event because the former shows up in students' to-do lists. Stefanie Sanders I would need the assignment to be graded though? And it's essentially 2 assignments but it would have to take place on 1 discussion board. Maybe I'm misunderstanding your logic? Help! haha. Lindsay, since Dallas E Hulsey uses this approach to his discussions regularly, I'm hoping he'll chime in to provide guidance. But in short, it's only one graded discussion and one ungraded assignment that serves as an alert/placeholder to let students know that they are required to post twice to the graded discussion. The ungraded discussion won't clutter up your gradebook, but students will have a visible reminder that appears in numerous places in the course letting them know when to post their initial post and when to post the reply. Thanks, Stefanie Sanders! I am happy to chime. Does that help Lindsay Gaughan? YES! Very much so! Thank you all for your helpful comments and replies! Lindsay Gaughan I don't know if this would be any help or not, but I do all my assignments as "quizzes" which are not really quizzes at all but just students completing a checklist to receive their credit for the assignment. Especially for assignments that are participation-oriented rather than with an evaluative grade, this can be a very useful way to get the students to know what participation is expected of them, and to have them record that participation on their own in the Gradebook. I actually use this approach for ALL the assignments in my classes, but it's also a technique you can use just for selected assignments. Re: Why does Canvas automatically deduct half for late assignments?